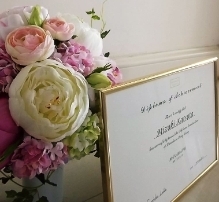 Floral Studio MIZUKi can take part of HANAHASU's Curriculum Course. HANAHASU is very famous flower school in HONG KONG. In HANAHASU Basic Course, for the first -time beginners can also learn all-round basic techniques steadily. There are a plenty of wonderful ideasand techniques in our compact design. This course will be suitable for those who want to start casually preserved flowers at ease. After complete the course (toal 5 lessons), a certificate will be issued. Curriculum lessons are composed of applied techniques with updated trend style. If you want to brush up skills simply or develop a broad range of the arrangements, this course will definitely satisfy you. After complete the course( total 8 lessons ), a certificate will be issued. This course is for acquiring the right knowledge of preserved flower and learning design style technology which you can utilize in your home lesson or on a variety of flower activities in your future. In curriculum, you can add your own value by learning basic arrangement upto making wedding bouquet. Besides, can acquire design technology logically . With respecting your own personalities , HANAHASU is wiiling to support your technical skills of flowers as well as opening your own school if you want after complete the curriculum in your future career development . We hope that you will be fall in love with preserved flower once will take the lesson , wishing your fruitful life. After complete the course( total 10 lessons ), a certificate will be issued. After complete all the courses of Basic, Interior Gift and Professional courses, if you want to apply to HANAHASU Diploma, it will be required to pass the examination. Afterwards Diploma will be issued. * Can be registered as HANAHASU Authorized School in your own school,.